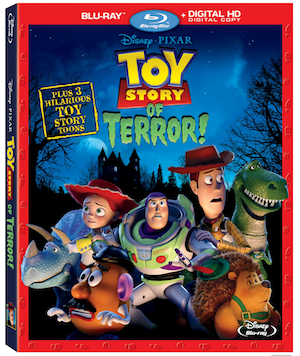 TOY STORY OF TERROR arrives on Blu-ray Combo Pack and Disney Movies Anywhere on August 19th! Reuniting after the events of the blockbuster smash “Toy Story 3,” Buzz, Woody and the gang join new friend Combat Carl for a spooky tale full of mystery and humor that’s a must-own for “Toy Story” and Disney•Pixar fans this summer! Never-before-seen bonus features include parody vintage toy commercials, deleted scenes, audio commentary and much more!